Can your dental health affect your blood pressure? The short answer to the question is YES, the health of your teeth and gums can affect your blood pressure. When you have advanced gum disease, or periodontitis, the key factor is inflammation. Periodontal disease is a chronic inflammatory disorder of the tissues surrounding the teeth, and it has been shown to affect inflammation in other areas of the body as well. It is associated with inflammatory diseases and complications involving the cardiovascular system, such as high blood pressure. Although many studies have analyzed how treating periodontal disease can affect the body’s blood pressure, few have studied the effect on blood pressure in those that take medication for the condition. 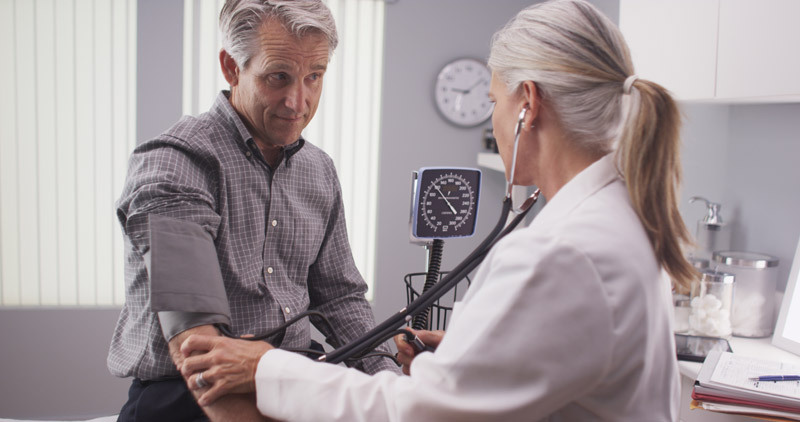 A recent study in Hypertension actually studied existing data from the National Health and Nutrition Examination Survey (NHANES) of patients over 30 that have been diagnosed with high blood pressure. What the researchers found is that the adults with periodontitis who are being treated for high blood pressure had higher blood pressure than the adults without periodontitis. In addition, the patients with periodontitis had lower success rates in their high blood pressure treatment, and also had higher odds of disease severity. This study follows a similar study conducted in 2015, utilizing the NHAMES database from Korea (KNHANES). The study, titled “Associations Among Oral Hygiene Behavior and Hypertension Prevalence and Control,” assessed data collected between 2008 and 2010 and found that subjects with poor oral hygiene habits were more likely to have higher hypertension frequency. Researchers concluded that oral hygiene may be considered an independent risk factor for hypertension and that maintaining good periodontal health habits may prevent and control the condition. Gum disease affects one of every two Americans age 30 and older. Caused by an inflammatory reaction to a bacterial infection below the gum line, periodontal disease can lead to swelling, irritation, receding gums, and tooth loss if left untreated. The American Academy of Periodontology (AAP) recommends regular flossing, brushing twice a day, and undergoing yearly comprehensive periodontal evaluations for the prevention of periodontal disease. The American Heart Association notes that 80 million American adults have been diagnosed with hypertension. Known as “the silent killer,” hypertension can lead to stroke, damage to the heart and arteries, and kidney damage. For more information on periodontal disease, and how it affects your health, visit the AAP website. Is Whitening Hurting Your Teeth? Dr. Kimbrough and Candice were very kind, caring and thorough. I greatly appreciate their care. Friendly staff and great care given! Another great experience as always! Drs. Randy and Scott Kimbrough and staff offer many dental services to treat every member of your family, and are dedicated to providing you with a pleasant visit and results that you’re proud to show off. © COPYRIGHT 2018 Kimbrough Dental. All Rights Reserved.